“Super” Sage Northcutt is planning on collecting a lot of gold in his ONE Championship career. After signing with the Asian mixed martial arts giant in early December, the 22-year old rising star is setting his sights on becoming a three-sport champion with the promotion. On an episode of The MMA Hour with Luke Thomas, “Super” Sage said that he wants to become a world champion in MMA, kickboxing, and Muay Thai, which is all possible thanks to ONE Championship’s ONE Super Series league. “What I think is cool is, they have, not only do they have MMA, but they also have Muay Thai and they have kickboxing,” Northcutt shared. “I want to be the champion in MMA, I want to be the champion in Muay Thai and kickboxing. I want to do it all. And I think that ONE Championship is going to be really cool because I believe that I’m going to display my different skills in each of those and I believe be the champ in each of those. I think it’s the perfect league,” he added. 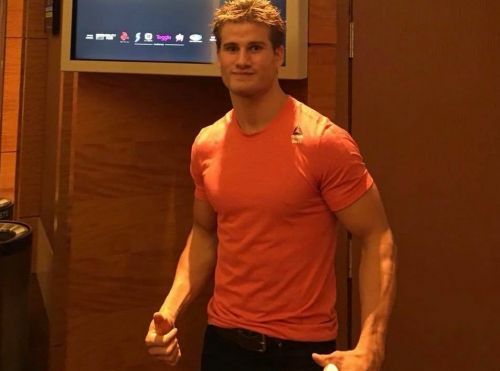 Northcutt is expected to make his debut with ONE when the promotion returns to Singapore on February 22nd, and says that he hopes to be competing for a world title sooner rather than later. “Being an MMA champion here in the future, very soon, I believe I can do that too,” he continued. Initially, the rising star wasn’t sure of his freedom to join the ONE Super Series, but now intends to “take advantage” of the opportunity to cross over to the different disciplines that ONE has to offer. Thomas touched on Northcutt possibly spreading himself too thin, but the Texas native believes that gaining experience in the striking-only disciplines will help in his development as a complete mixed martial artist as well. “I think it’s just going to make me a better athlete all-around. I don’t think I’m going to spread myself too thin, I think if my kickboxing and Muay Thai gets better, then my MMA is going to be getting better too. Obviously I’m with one of the best gyms in the world at Team Alpha Male with Urijah Faber and all the great guys over there, so I think my wrestling and my jiu-jitsu is always improving, so if I have the better stand-up also, all-around, I’m going to be a better fighter,” Northcutt expressed.